Today the White House announced its expected talent lineup for next Monday's Easter Egg Roll -- and go figure, some big names are on the list. Willow Smith, Greyson Chance and Little Beat and DJ WillyWow will perform on the Rockin' Egg Roll Stage. Pop singer-songwriter Colbie Caillat (we're not sure, but we think the kids'll love her) will sing the National Anthem. Kelly Ripa and Mark Consuelos; Elmo, Maria and Gordon of "Sesame Street," Kristi Yamaguchi and Geena Davis are among those who will be reading at the Storytime Stage. In the Egg-tivity Zone (oh, we see what they did there! ), pro sports stars and coaches will play with kids and offer tips on staying active. Among those expected: D.C. United's Bryan Namoff, Josh Wolff and Ben Olsen; the Nats' Jim Riggleman, Adam Laroche and Ryan Zimmerman; and Olympic stars Tyson Gay and Bryan Clay. 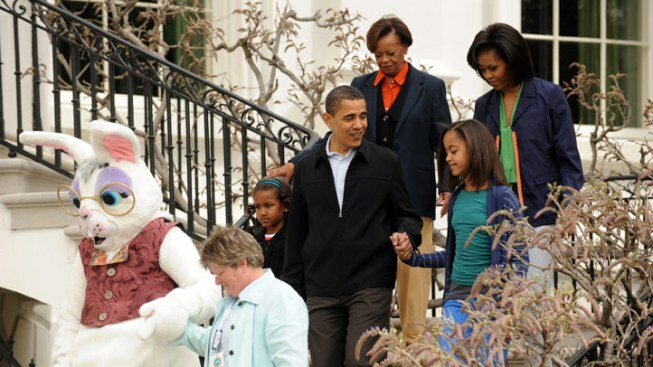 And don't expect bacon cheeseburgers to be on the menu for this year's White House Easter Egg Roll. We know, you're shocked. Instead, the theme of "Get Up and Go!" corresponds to First Lady Michelle Obama's Let's Move initiative, with next Monday's event geared toward encouraging kids to focus on healthy eating and exercise. Activities on the South Lawn will include obstacle courses, yoga, dancing and of course, the expected egg roll with the Obama family. 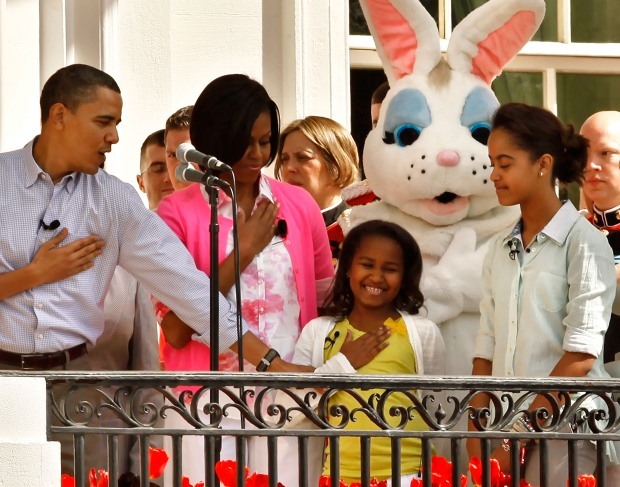 The Easter Egg Roll is the largest annual public event at the White House, with 30,000 people from all 50 states and the District of Columbia scoring tickets via online lottery. All the tickets have been given out, so if you don't have yours this time, try again next year... provided you have kids under the age of 12. And pets don't count.